This waste oil heater will save you thousands of dollars in heating bills. Roger Sanders' improved version of the Mother Earth News waste oil heater solves all the problems that made the original MEN version difficult to use. Roger's design is simple, reliable and easy to use – it's quiet and uses no electricity – it has reliable oil flow and a wide heat range – it's easy to light and easy to clean. "It is a practical design that you can use day in and day out for seriously heating your dwelling or workshop without costing you a lot of time and frustration," he says. Now, after five years of use, much experimentation, many upgrades, and hundreds of letters from readers and builders, Roger has updated his original waste oil heater project with a great deal of new information and new options. Easy to build: "The design of the heater is non-critical, and easy for DIYers to build with common tools. You don't have to build a heater exactly like mine to make it work." Heat range: The heater runs smoothly at any temperature from 180 to 1,000 degrees F (82 to 538 degrees C) – for more heat, all you have to do is increase the oil-flow by opening the needle valve on the oil feed. "My heater will put out an awful lot of heat. My shop is poorly insulated, yet the heater has no trouble holding a room temperature of 100 degrees F (38 degrees C), when the outside temperature is –20 degrees (–29 degrees C). That's a 120-degree temperature gradient (67 degrees C) in what is essentially a 4-car garage. That's a lot of heat." Quick, simple, efficient: "The burner is incredibly simple and is quick and easy to clean. Cleaning takes only seconds as all you need do is lift the burner out of the heater and scrape its flat conical surface with a putty knife. "This design allows me to obtain excellent heat control over a very wide temperature range. I can get huge amounts of heat or turn it down to where the heater is just barely warm. 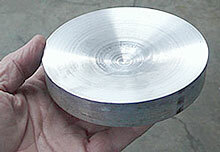 "It is like using a large combustion chamber for high heat and a small one for low heat. As a result, the heater burns efficiently and uses a minimum of fuel for any given heat setting." Fuel consumption: "When turned down to a low setting, the heater will burn less than a gallon of oil per day (3.8 liters). When the heater is running on 'high', it can burn about one gallon per hour." Environmental issues: "Commercial waste oil heaters use large amounts of electricity, which is expensive and defeats the idea of using 'free' fuel and being environmentally responsible. They atomize the oil through a nozzle. The contaminants in the oil are atomized as well, and a blower is used, causing the contaminants to be blown out the flue into the atmosphere. The contaminants include toxic substances such as heavy metals (lead, zinc, cadmium. chromium) that are better left behind in a burner rather than being discharged into the atmosphere where we can breathe them. "So vaporization heaters like the MEN heater are more 'green' than an atomization heater. My heater distills the oil, automatically removing heavy metals from the oil before burning it. This heater effectively eliminates airborne, heavy metal pollution. I consider my heater to be environmentally friendly and essentially pollution-free." Carbon emissions and greenhouse gases: "Commercial waste oil heater emissions also include carbon monoxide gas, a deadly poison, along with the global warming gases carbon dioxide and methane. My heater does not burn the carbon in the oil. It remains as solid carbon molecules we know as soot. 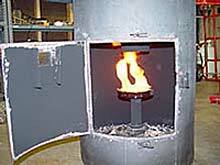 The soot molecules flow out of the flue with the exhaust gases and you see this as smoke – less than what you would see from a wood stove, but still visible. Soot molecules are actually carbon molecules, they simply drop out of the air as harmless carbon. Soot is a more benign way to deal with the carbon in oil than burning it." Using waste vegetable oil (WVO): "Many readers will want to burn waste vegetable oil. Once started with a second shot of kerosene, veggie oil burned okay. A pool of liquid vegetable oil formed on the burner and the heater ran reliably and cleanly using only pure vegetable oil." Automation: "The heater I actually use is self-cleaning and it operates under thermostatic control. It has safety features so there is no possibility of an oil spill, and I only have to clean it once a month." – Detailed discussion of automation options. Everything you need to know! Keep warm and cut the bills! It's an e-book, a 613 kb Adobe Acrobat pdf file named RSwoh.pdf.